Mother's Day is just around the corner. 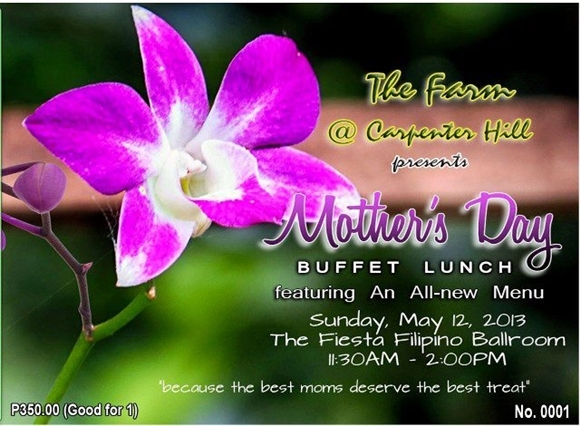 This year treat Mom to The Farm @ Carpenter Hill's All-New Menu Buffet Lunch. It will start around 11:30 AM - 2:00 PM on Sunday, May 12, 2013 at the Fiesta Filipino Ball Room. Tickets are priced at P350.00/head for adults and P200.00/head for kids below 10 years old. The Farm @ Carpenter Hill is located at Gensan Drive, Brgy. Carpenter Hill, City of Koronadal.